Yellowing of the skin and sclera (actually, the conjunctiva overlying the sclera) caused by Hepatitis A.
Jaundice, also known as icterus, is a condition in which there is a yellowish discoloration of a person's skin, the whites of the eyes (the conjunctival membranes over the sclerae), and other mucous membranes as a result of increased levels of the bile pigment bilirubin in the blood (hyperbilirubinemia). This hyperbilirubinemia subsequently causes increased levels of bilirubin in the extracellular fluids. Jaundice itself is not a disease, but rather a sign of one of many possible underlying pathological processes that occurs at some point along the normal physiological pathway of the metabolism of bilirubin. Bilirubin is a component of bile, which is made in the liver and important in digestion. The yellowish color of bile comes from bilirubin. The causes of jaundice can be divided into three categories based on where the condition starts relative to the liver: Pre-hepatic (before the liver), heapatic (in the liver), and post-hepatic (after the liver). Jaundice is sign of an underlying condition whereby the normal harmony of the body is disrupted. In the case of newborns, it normally is harmless, although it must be carefully monitored and treated if levels of bilirubin get too high, when it can become serious. There are numerous other causes of jaundice, such as malaria, side effects of certain drugs, hepatitis, cirrhosis, hereditary diseases such as Gilbert's syndrome, gallstones, and so forth. Jaundice allows the patient and doctor to recognize that there is an underlying problem that needs to be addressed. Jaundice comes from the French word jaune, meaning yellow. The liver functions as a critical control center that integrates various metabolic processes. Most compounds absorbed by the intestine pass through the liver. The liver also processes chemicals that it collects from the blood. The liver processes chemical waste products and other toxic materials and excretes them, is involved in the synthesis of blood-clotting factors, and coordinates the the destruction of worn-out red blood cells. One of the most important functions of the liver is the secretion of bile, an alkaline compound that aids in the digestion of lipids. Bile is a thick, greenish-yellow alkaline fluid that assists in digestion by breaking down fats, mostly triglycerides, into monoglycerides and fatty acids. Bile is also valuable in the absorption of fat-soluble vitamins and the elimination of waste products, which are secreted by the liver into the bile and eliminated in feces. A major pathway for eliminating free cholesterol is via secretion into bile. Bile serves as the route for excretion of the hemoglobin breakdown product bilirubin, which gives bile its yellowish color. Bilirubin is the breakdown product of normal heme catabolism. Heme is formed from hemoglobin, a principal component of red blood cells. Bilirubin is elevated in certain diseases. It is responsible for the yellow color of bruises and the yellow discoloration in jaundice. Typically, the concentration of bilirubin in the plasma must exceed 1.5 mg/dL, three times the usual value of approximately 0.5mg/dL, for the coloration to be easily visible (Duyton and Hall 2005). In order to understand how jaundice results, it is helpful to understand the normal pathological processes that cause jaundice to take their effect. When red blood cells have completed their life span of approximately 120 days, or when they are damaged, their membranes become fragile and prone to rupture. As each red blood cell traverses through the reticuloendothelial system, its cell membrane ruptures when its membrane is fragile enough to allow this. Cellular contents, including hemoglobin, are subsequently released into the blood. The hemoglobin is phagocytosed by macrophages, and split into its heme and globin portions. The globin portion, being protein, is degraded into amino acids and plays no further role in jaundice. Two reactions then take place with the heme molecule. The first oxidation reaction is catalyzed by the microsomal enzyme heme oxygenase and results in biliverdin (green color pigment), iron, and carbon monoxide. The next step is the reduction of biliverdin to a yellow color tetrapyrol pigment called bilirubin by cytosolic enzyme biliverdin reductase. This bilirubin is "unconjugated," "free," or "indirect" bilirubin. Approximately 4 milligrams per kilogram of bilirubin is produced each day (Pashankar and Schreiber 2001). The majority of this bilirubin comes from the breakdown of heme from expired red blood cells in the process just described. However approximately 20 percent comes from other heme sources, including ineffective erythropoiesis, breakdown of other heme-containing proteins, such as muscle myoglobin, and cytochromes (Pashankar and Schreiber 2001). This conjugated bilirubin is excreted from the liver into the biliary and cystic ducts as part of bile. Intestinal bacteria convert the bilirubin into urobilinogen. From here the urobilinogen can take two pathways. It can either be further converted into stercobilinogen, which is then oxidized to stercobilin and passed out in the feces, or it can be reabsorbed by the intestinal cells, transported in the blood to the kidneys, and passed out in the urine as the oxidized product urobilin. Stercobilin and urobilin are the products responsible for the coloration of feces and urine, respectively. As noted above, unconjugated bilirubin is insoluble in water. The liver changes it into a type that is soluble, known as conjugated biluribin. Blood tests can distinguish these two types (Polsdorfer 2002). Pre-hepatic jaundice is caused by anything that results in an increased rate of hemolysis (breakdown of red blood cells), resulting in diseases known as hemolytic disorders. In tropical countries, malaria can cause jaundice in this manner. Certain genetic diseases, such as sickle cell anemia, spherocytosis, and glucose 6-phosphate dehydrogenase deficiency can lead to increased red cell lysis and therefore hemolytic jaundice. Commonly, diseases of the kidney, such as hemolytic uremic syndrome, can also lead to coloration. Hemolytic disorders also can result as the side effects of various drugs, such as levodopa, a drug to treat Parkinson's disease (Polsdorfer 2002). If someone does heroin, he or she probably will have jaundice. Other causes include poisons (snake and spider venom, certain bacterial toxins, and so on), artificial heart values, diseases of the small blood vessels, immune reactions to red blood cells, transfusions with an incompatible blood type, kidney failure, and erythroblastosis fetalis (disease of newborns). Defects in bilirubin metabolism also present as jaundice. Jaundice usually comes with high fevers. Rat fever (leptospirosis) can also cause jaundice. Hepatic jaundice causes include acute hepatitis, hepatotoxicity, and alcoholic liver disease, whereby cell necrosis reduces the liver's ability to metabolize and excrete bilirubin leading to a buildup in the blood. Less common causes include primary biliary cirrhosis, Gilbert's syndrome (a genetic disorder of bilirubin metabolism that can result in mild jaundice, which is found in about 5 percent of the population), Crigler-Najjar syndrome, metastatic carcinoma, and Niemann-Pick disease, type C. Starvation and certain medications can cause hepatic jaundice as well. Jaundice seen in the newborn, known as neonatal jaundice, is common, occurring in almost every newborn as hepatic machinery for the conjugation and excretion of bilirubin does not fully mature until approximately two weeks of age. Urine: Conjugated bilirubin present, urobilirubin > 2 units but variable (except in children). Post-hepatic jaundice, also called obstructive jaundice, is caused by an interruption to the drainage of bile in the biliary system; that is, the soluble bilirubin fails to reach the intestines after leaving the liver. The most common causes are gallstones in the common bile duct, and pancreatic cancer in the head of the pancreas. Also, a group of parasites known as "liver flukes" live in the common bile duct, causing obstructive jaundice. Other causes include strictures of the common bile duct, biliary atresia, ductal carcinoma, pancreatitis, and pancreatic pseudocysts. 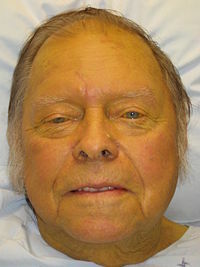 A rare cause of obstructive jaundice is Mirizzi's syndrome. Pregnancy on rare occasions also can cause the bile in the ducts to stop flowing (Polsdorfer 2002). Patients also can present with elevated serum cholesterol, and often complain of severe itching or "pruritus." Neonatal jaundice is usually harmless: This condition is often seen in infants around the second day after birth, lasting until day 8 in normal births, or to around day 14 in premature births. Jaundice in newborns normally is the result of two conditions occurring at the same time: A pre-hepatic and hepatic source of excessive bilirubin. The fetal type of hemoglobin present at birth, which was able to obtain oxygen from the lower levels present in the mother's blood, is no longer needed, as the newborn can now use adult hemoglobin and extract oxygen directly from his or her own lungs. Fetal hemoglobin is thus removed from the system, but the resulting bilirubin overloads the system and places demand on the liver to clear it, but the liver needs time to catch up, with the baby jaundiced during this time (Polsdorfer 2002). Serum bilirubin normally drops to a low level without any intervention required: the jaundice is presumably a consequence of metabolic and physiological adjustments after birth. In extreme cases, a brain-damaging condition known as kernicterus can occur; there are concerns that this condition has been rising in recent years due to inadequate detection and treatment of neonatal hyperbilirubinemia. Neonatal jaundice is a risk factor for hearing loss (O'Keefe 2001). The appearance of the patient's skin complexion and eyes can help in the diagnosis of jaundice. The presence of absence of fever and the location and severity of abdominal pain can help distinguish between hepatic and obstructive jaundice and the doctor and feel for the liver and spleen for signs of enlargement (Polsdorfer 2002). Various imaging techniques can help identify disease in the biliary system. These include X rays taken a day after swallowing a contrast agent, as well as CT and MRI scans. No one test can differentiate between various classifications of jaundice. A combination of liver function tests is essential to arrive at a diagnosis. Most patients presenting with jaundice will have various predictable patterns of liver panel abnormalities, though significant variation does exist. The typical liver panel will include blood levels of enzymes found primarily from the liver, such as the aminotransferases (ALT, AST), and alkaline phosphatase (ALP); bilirubin (which causes the jaundice); and protein levels, specifically, total protein and albumen. Other primary lab tests for liver function include GGT and prothrombin time (PT). While a urinary test for bilirubin can be performed, typically if the urine is dark one can assume a high level of conjugated bilirubin, and therefore also assume high blood levels of bilirubin. Since typically unconjugated bilirubin will not be found in urine, dark urine can be used as a quick way to rule out unconjugated bilirubin disorders. 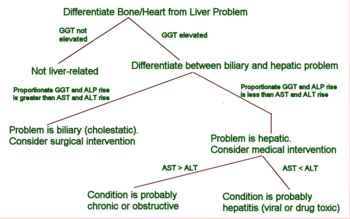 Some bone and heart disorders can lead to an increase in ALP and the aminotransferases, so the first step in differentiating these from liver problems is to compare the levels of GGT, which will only be elevated in liver-specific conditions. The second step is distinguishing from biliary (cholestatic) or liver (hepatic) causes of jaundice and altered lab results. The former typically indicates a surgical response, while the latter typically leans toward a medical response. ALP and GGT levels will typically rise with one pattern while AST and ALT rise in a separate pattern. If the ALP (10-45) and GGT (18-85) levels rise proportionately about as high as the AST (12-38) and ALT (10-45) levels, this indicates a cholestatic problem. On the other hand, if the AST and ALT rise is significantly higher than the ALP and GGT rise, this indicates an hepatic problem. Finally, distinguishing between hepatic causes of jaundice, comparing levels of AST and ALT can prove useful. AST levels will typically be higher than ALT. This remains the case in most hepatic disorders except for hepatitis (viral or hepatotoxic). Alcoholic liver damage may see fairly normal ALT levels, with AST 10x higher than ALT. On the other hand, if ALT is higher than AST, this is indicative of hepatitis. Levels of ALT and AST are not well correlated to the extent of liver damage, although rapid drops in these levels from very high levels can indicate severe necrosis. Low levels of albumin tend to indicate a chronic condition, while it is normal in hepatitis and cholestatis. Lab results for liver panels are frequently compared by the magnitude of their differences, not the pure number, as well as by their ratios. The AST:ALT ratio can be a good indicator of whether the disorder is alcoholic liver damage (10), some other form of liver damage (above 1), or hepatitis (less than 1). Bilirubin levels greater than 10 times normal could indicate neoplastic or intrahepatic cholestasis. Levels lower than this tend to indicate hepatocellular causes. AST levels greater than 15 times normal tends to indicate acute hepatocellular damage. Less than this tend to indicate obstructive causes. ALP levels greater than 5 times normal tend to indicate obstruction, while levels greater than 10 times normal can indicate drug (toxic) induced cholestatic hepatitis or Cytomegalovirus. Both of these conditions can also have ALT and AST greater than 20 times normal. GGT levels greater than 10 times normal typically indicate cholestasis. Levels 5 to 10 times normal tend to indicate viral hepatitis. Levels less than 5 times normal tend to indicate drug toxicity. Acute hepatitis will typically have ALT and AST levels rising 20-30x normal (above 1000), and may remain significantly elevated for several weeks. Acetominiphen toxicity can result in ALT and AST levels greater than 50x normal. Jaundice in newborns is important to measure repeatedly and treat if it threatens to get too high, as the insoluble bilirubin can get into the brain. For some time, the only treatment was exchanging most of the baby's blood; however, it now is recognized that a bright blue light will render the bilirubin harmless. Babies now are fitted with eye protection and placed under bright fluorescent lighting, with the chemical altering the bilirubin in the blood as it passes through the skin (Polsdorfer 2002). Hemolytic disorders resulting in jaundice may not be treated specifically for the jaundice, other than the underlying condition. The hemolytic disorders may be trated with medications and blood transfusions, or in the case of a large spleen, surgical removal of the spleen can sometimes be done. Any drugs being taken that can cause hemolysis or stop the flow of bile need to be stopped (Polsdorfer 2002). Obstructive jaundice frequently is treated with a surgical procedure (Polsdorfer 2002). Preventive measures involve prevention of the underlying condition, such as taking precautions against malaria and preventing erythoblastosis fetalis by giving an Rh negative mother a certain solution if it appears she is developing antibodies to her baby's blood (Polsdorfer 2002). It was once believed persons suffering from the medical condition jaundice saw everything as yellow. By extension, the jaundiced eye came to mean a prejudiced view, usually rather negative or critical. Alexander Pope, in "An Essay on Criticism" (1711), wrote: "All seems infected that the infected spy, As all looks yellow to the jaundiced eye" (Rogers 1985). Similarly in the mid- nineteenth century, the English poet Lord Alfred Tennyson wrote in the poem "Locksley Hall:" "So I triumphe'd ere my passion sweeping thro' me left me dry, left me with the palsied heart, and left me with a jaundiced eye." Guyton, A., and J. Hall. 2005. Textbook of Medical Physiology. Saunders. ISBN 9780721602400. O'Keefe, L. 2001. Increased vigilance needed to prevent kernicterus in newborns. American Academy of Pediatrics 18(5): 231. Retrieved February 17, 2009. Pashankar, D., and R. A. Schreiber. 2001. Jaundice in older children and adolescents. Pediatrics in Review 22(7): 219–226. PMID 11435623. Retrieved February 17, 2009. Polsdorfer, J. R. 2002. Jaundice. Pages 1880-1885 in J. L. Longe (ed. ), The Gale Encyclopedia of Medicine. Detroit, MI: Gale Group/Thomson Learning. ISBN 0787654892. Rogers, J. T. 1985. The Dictionary of Cliches. New York: Ballantine Books. ISBN 0345338146. This page was last modified on 22 August 2016, at 16:36.